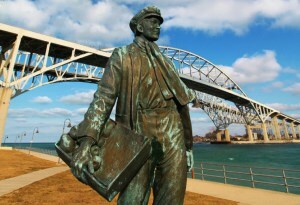 Port Huron’s most famous son is undoubtedly inventor Thomas Edison who moved to the city in 1854 when he was 7 years old. His father moved the family from Milan Ohio to Port Huron in hopes of making a better living working as a farmer, land speculator, and carpenter. Growing up in Port Huron, Thomas Edison worked as a newspaper and books salesmen on the trains going from Port Huron to Detroit. While working he gained a fascination for learning and read many of the books that he sold. With the money he made from working Edison bought scientific equipment, and turned one of the baggage cars into his own laboratory. Leaving Port Huron, Thomas Edison continued to work on the railways until he set up a workshop in Newark, New Jersey. Here he invented the quadruplex telegraph system and sold it for $40,000 dollars to the Western Union Telegraph Company. (Smithsonian web) With the money Edison constructed a new workshop where he was able to produce his most famous inventions. He went on to produce the electric light bulb, the phonograph, the improved electric pen, and even improved upon Alexander Graham Bell’s telephone by creating a far more advanced transmitter. Today Port Huron honors his memory with the Thomas Edison Depot Museum, which is housed in the same building where Edison sold his newspapers. The Museum tells the story of Thomas Edison’s time in Port Huron by re-creating the Railroad Baggage Car and providing visitors an inside look on Thomas Edison’s childhood.